Boxing trainer, Abel Sanchez, is one of the best and most respected corner-men in the sport. He has a great stable of fighters and is one of the most active trainers in the game. The biggest fight of his training career is now less than two weeks away when IBO/WBC/WBA/IBF middleweight champion, Gennady Golovkin faces off against Canelo Alvarez on September 16th in Las Vegas. The winner of this fight is expected to not only be considered the best middleweight in the world, but also the sports best pound-for-pound fighter. 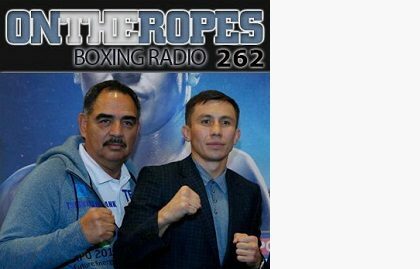 In part 1 of my “On The Ropes” boxing radio interview with Abel Sanchez, I discuss with him the training of Gennady Golvokin for his fight against Canelo and talk about the preparations they are making to deal with Alvarez’ style. Sanchez also talks about the views of people that Golovkin has shown signs of decline and talks about the betting odds for the bout. Additionally, Abel speaks on why he thinks Canelo is taking the fight now and if he thinks the bout is taking place at the perfect time for the sport. Here is what Abel Sanchez had to say. Jenna J: We are now less than two weeks before the fight between Saul Alvarez and Gennady Golovkin. How have the preparations been going for the fight? Abel Sanchez: It’s going well. We are sparring now and we got some great guys in camp with us right now. We’re just grinding along, making sure we’re ready for the 16th. Jenna J: Have you done anything different in preparing for someone like Canelo? Abel Sanchez: No, I really don’t do anything different. I train Gennady to be the best that he can be and Canelo will have to adapt to that. If you want to say I’m doing something different, what I did is I brought in some faster guys into camp to give us some speed, but other than that the preparation has been the same. Jenna J: In terms of sparring partners, what more can you say about the guys you brought in? Canelo is known for his speed and body punching, have you brought anyone in to account for that? Abel Sanchez: He does well to the body against guys that allow him to do that. He does well to the body against other fighters, but if he starts to go to the body against Gennady, he’s going to have to expose himself. How much of that he does, we’ll see on the 16th. We brought in Julian Williams, Kyrone Davis, Dashon Johnson, Kenneth McNeil, we have seven guys in camp that are giving us the kind of speed and work that we need. Jenna J: Gennady is 35 years old right now and some people are wondering if he’s taken a step back after his last two performances. Where do you feel he’s at now at his age? Abel Sanchez: I think it’s kind of funny that people have comments like that. Nobody ever said anything about Floyd Mayweather getting old when he got rocked by Shane Mosley or when he was repeatedly getting hit by Maidana. Nobody said anything when Andre Ward got dropped in the first fight against Kovalev. It seems funny to me that this guy has the highest knockout ratio in middleweight history, he’s undefeated, he’s never been hurt, never been down, but yet he’s getting old. People are funny, but I guess they hold him on such a high pedestal that everything he does has to be perfect. Danny Jacobs was the second best middleweight in the world, Kell Brook was an undefeated welterweight champion who I knew was going to be difficult from the beginning because he was fast. These guys are quality guys, so it’s funny that Gennady gets those comments made about him. Jenna J: Regardless of those comments, Gennady is the favorite. Why do you feel the odds makers are giving the odds to Gennady? Abel Sanchez: I think that in Vegas they are used to making money, not losing money and the odds makers in Vegas seem to think that there is a reason why Gennady is favored, because of the quality of who he is and what he has done. They wouldn’t have made him the favorite and lost money on purpose because of what the naysayers are saying. They made Gennady the favorite because they understand the quality. Like I said, Las Vegas bookmakers are not used to losing money. Jenna J: Canelo Alvarez is 27 years old right now and most people say that he’s improved greatly over the last few years. Do you think it was the right decision for him to wait to this point to make the fight? Abel Sanchez: I think that it’s the right decision for boxing. I think it’s the two best guys in boxing right now, especially with the middleweight division being as stacked as it is. I think it’s good that the promoters and decision makers didn’t wait five years like they did with Mayweather and Pacquiao. I think it was the right timing. I believe Oscar only took the fight because of the Jacobs fight, but that’s okay, we are in preparations for probably the most important fight in a long time for our sport. 2 Responses to "Abel Sanchez: “Gennady Golovkin is the favorite because sports books are not used to losing money”"
GGG better win by stoppage or at least knock Canelo down several times to win by decision. Otherwise Canelo will get the W based on my crystal ball!